I really dislike wasting food-wasting anything for that matter. I feel guilty being wasteful. Whenever I have fruit that's quickly becoming over-ripe, I cook it, and try to use it in a dessert or jam. 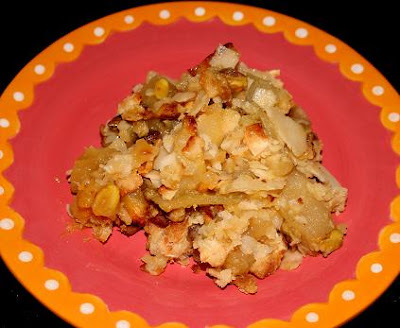 Here are two quick crumbles that use the same topping. My quick, go-to crumble topping recipe is: 3/4 cup flour, 1/2 cup sugar, 1/3 cup cold buter or vegan margarine. Just crumble up the ingredients with your fingers until the butter/margarine is in small pieces. 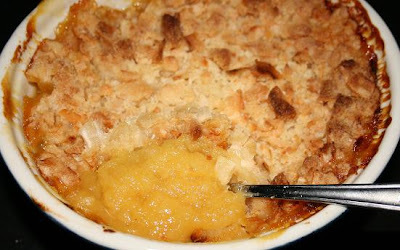 For the pineapple crumble: I put some of my pineapple jam in a casserole dish and put on a layer of crumble topping and some dried unsweetened coconut. I baked it in a 350F oven until the top was browned. You could add some dark rum or cinnamon as flavoring for the filling. For the apple crumble: I filled a baking dish with thinly sliced apples, pistachios, and dried coconut. I sprinkled in some cinnamon and sugar, to taste. I also added a few pats of butter or margarine, and a splash of apple juice. Again, I bake the apples until the juices were bubbly and the topping lightly browned. Both of these dishes are good for dessert or breakfast. They are especially nice with vanilla ice cream.